Fall in the Twin Cities isn’t complete without a trip to Black Forest Inn to celebrate Oktoberfest. 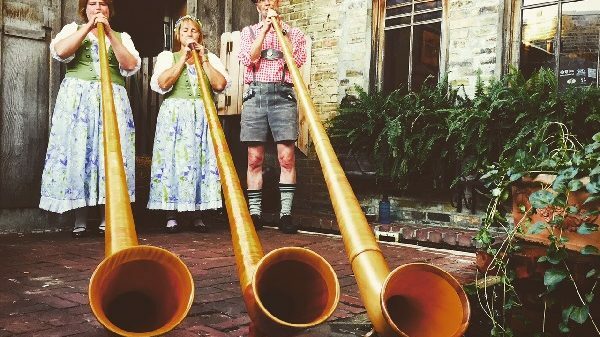 What most people don’t know is Oktoberfest began as a wedding celebration. In the fall of 1810, Crown Prince Ludwig of Bavaria was married. The wedding celebration continued for two weeks and the German people loved the idea so much, it has been celebrated yearly for over 200 years! While most people associate Oktoberfest with lots of beer drinking, it’s always been a carnival-like celebration in Germany. There are rides and games, and Munich holds the annual poster contest (an idea we’ve borrowed! Click here for contest guidelines). The foods that you will see on every corner at Oktoberfest include Roast or Rotisserie Chicken, Pretzels and, of course, sausages. We’ve got all those food and great German beer too! (Click here for Oktoberfest food specials menu) So join in the fun this fall at the Black Forest Inn! See below for details & schedule of events. This year’s festivities will include: Freudian Slips! Maskenball! Krautrock! Kids Speaking German! Celebrity keg tapper! Tubas! Weisenheimers! Paranormal Tours! Deep fried stuff! Prizes! Weddings! Cheap Beer! …and more!!! 7:30 – 9:30 pm Live music! As you know, originally Oktoberfest was a wedding celebration. So we’re going back to its roots and honoring the original Oktoberfest tonight. Get married! Renew your vows! Celebrate your anniversary! We have all the fixin’s: ministers, flowers, bridesmaids, wedding cake, and an atmosphere of love. 6:30 – 9:00 pm Live music! Hacker-Pschorr Night! Buy any Hacker-Pschorr and get a logo glass for $1! In February and March of 1943* in Berlin, a group of women protested the detention of their Jewish husbands, who had, up until that point, been exempted from deportation by virtue of being married to non-Jewish women. Rosenstrasse was a street in a traditionally Jewish neighborhood and that is where the detention center was located. The women protested day and night chanting “Give us our husbands back!” despite being threatened with machine gun wielding SS officers every day. The crowd of women grew, emboldened by the sense of safety in numbers and after weeks of protest, Goebbles himself decreed that it would be easier to just release the men than continue to listen to the constant shouting outside. The building was bombed by the Allies near the end of the war, but several monuments on the site have been erected to honor the women who saved their husbands. You know goes with dumplings? Beer, that’s what. In 1967 a man living in a town near Munich protested the low flying Starfighters, which roared over his property. He built a catapult and relentlessly fired dumplings at the aircraft. His one-man protest eventually made international headlines and, more satisfyingly, he succeeded in changing the flight paths away from the area entirely. 6:30 pm – 9:00 pm Live Music! One hundred years ago a group of artists came together at Cabaret Voltaire in Zurich. For the next eight years and along with groups in five other cities, the group known as Dada challenged society with their performances, writing, visual art, music and manifestos. Their work continues to challenge and inspire people today, just please don’t ask us what it means. Win nothing! Winning is nothing! Nothing is won! The artists who founded the Dada movement were angry and convinced that the materialism and nationalism that pervaded Western society had brought about World War I. Their art was intended as a critique of, and challenge to, bourgeois society and the authoritarianism it supported. Though they sincerely hoped to end the war with their art, they also seriously innovated art as they knew it. They incorporated chance into the creation of art; they used “readymade” objects and, with minimal preparation, displayed them as art; they even picked a name that evokes nonsense in many languages. They so opposed conventional thinking they even opposed themselves, often declaring “Dada is anti-Dada!” Though the movement itself gave way to Surrealism and the Western world ultimately descended into war again and now again, much of their work stands as truly innovative, challenging and surprisingly modern and relevant one hundred years later. Got some beefs? A few issues? One or two pet peeves? Or 95 of them? Martin Luther had 95 points of contention with the church and he nailed them to the church door. We’ve got some complaints ourselves and we’ve got a door to nail them to. Care to join us? Martin Luther was a devout monk who believed the Catholic Church was losing its way. He particularly objected to the selling of Indulgences, the practice of accepting donations to the church in exchange for the absolution of sins. Luther strongly believed that the clergy could neither confer absolution nor salvation upon anyone; only God could do that. Furthermore, the selling of indulgences was a transparent grab for money that the church didn’t need, but the clergy clearly wanted. He summarized his concerns into a 95 point document, which, legend has it, on October 31, 1517, he nailed to the Wittenberg Castle church door. He was reform minded, but had no intention of being a revolutionary. He succeeded in getting the Church to call a conclave to address his issues, but they ultimately rejected his criticisms and called for him to recant them. He refused and his defiance sparked a theological revolution, as well as a political one (though he took a leadership role in neither). After finally being excommunicated he devoted ten years to translating the Bible into German, believing that ordinary people ought to have access to the Word of God. He then faded into obscurity, even as his cause burned more and more brightly across Europe. 6:30 – 8:00 pm Is Your German Better then a Sixth Graders? Sixth graders from the Twin Cities German Immersion School will challenge your German! Once again, we honor Mr. Hoff-tastic himself tonight (He’s big in Germany!) We will have his face all over the restaurant! The main event is the giveaway of an array of excellent un-Hoffingly-believable prizes. Surly Night!Buy any sized Surly Fest beer and get a logo stein for $1! Well, he didn’t exactly bring down the Berlin Wall, but he genuinely was a symbol of freedom for the Germans at that time, largely on the strength of his number one hit in Europe, “Looking for Freedom.” Europe, and particularly Germany, had embraced American pop culture in the late 1980s and, for some reason, Dallas, Baywatch and David Hasselhoff in particular. His song “Looking for Freedom” played in every nightclub in Berlin all throughout the fall of 1989. After the wall fell, a unified Berlin put on a spectacular New Year’s Eve party and the main event was a David Hasselhoff concert. Do the Germans recognize that he is not a great singer (or actor)? Of course. Do they still have a soft spot for him in their hearts? Yes, yes, they do. The black turtleneck is the outfit of choice for 20th century protesters of anything. Because it’s essential to stay warm, have freedom of movement and look androgynous while you rage at society / patriarchy / disco / the government / the mainstream / nuclear power. We don’t want to lug any barrels home with us after the party, so we’re going to start dropping the price of beer at 2 pm, and keep dropping it until the beer is gone. Seriously.